Hardcover, 5.5 x 8.5 in. / 208 pgs. Particularly since September 11, the War on Terrorism and the war in Iraq, it has been almost impossible to dissociate architecture from its social context. Add to this the massive influence of capitalism on architecture, disturbing demographic developments and associated political, social, and ecological catastrophes, and the result is a robotic snapshot of a society dominated by fear, exclusion and simulation. 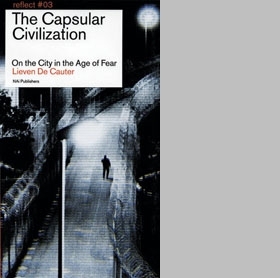 Lieven De Cauter, a leading theoretician on the subject of capsularisation, has worked over the past six years on the essays and articles contained in this book, and has documented and analyzed our changing societies before and after 9/11. For the first time, the link between the global economy, demographic changes, world terror and the role played by the United States under the Bush admisinstration, are examined in detail in a single publication. 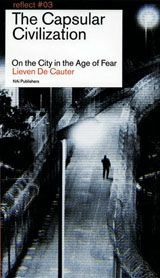 De Cauter sketches a realistic and alarming account of the new world order that is an everyday concern for the architects and planners of the contemporary city as well as for its inhabitants and users. FORMAT: Hardcover, 5.5 x 8.5 in. / 208 pgs.